Raising the minimum wage is a polarising issue. One side worries that raising it will lower employment. The other side downplays the impact on employment and plays up the positive impact on the living standards of the poor. Both sides are able to cling to their beliefs as the evidence, much of which comes from high-income (“advanced”) economies, is mixed. The majority of the global labor force, however, is in the emerging markets. Moreover, for a number of these countries, instituting a minimum wage or raising it is squarely on the policy agenda. But little is known about the impacts of minimum wages on employment and living standards in emerging markets. 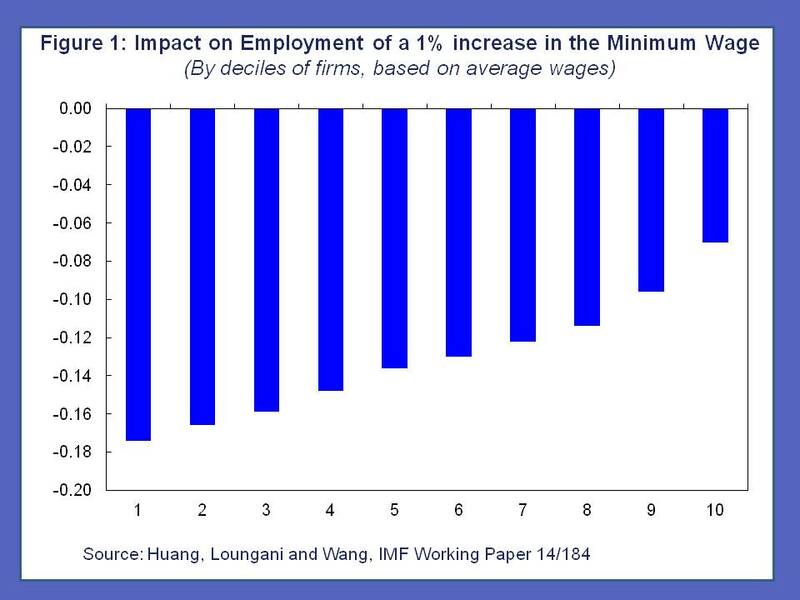 My recent work with Yi Huang and Gewei Wang tries to fill this gap by studying the impact of minimum wage policies on employment in China. As China accounts for nearly 25 percent of the global labor force, this evidence is important in its own right; it may also be more relevant for other emerging markets than the evidence from high-income countries. Our study is the first to use data on minimum wage changes for over 2400 counties in China. We combine the information on minimum wages changes with employment data from the Annual Survey of Industrial Firms, which covers over 70 percent of China’s manufacturing employment. While China instituted a minimum wage system in 1994, enforcement of compliance with the law was significantly tightened only in 2004; the results described below are based on post-2004 data. So what does the evidence show? On average across all firms, we find that an increase in the minimum wage leads to a small decline in employment: a 10% percent increase in the minimum wage lowers employment by a little over 1% percent. The impact differs across firms, being greater in low-wage firms than in high-wage firms. This is shown in Figure 1, where firms are grouped into deciles based on the average wage. 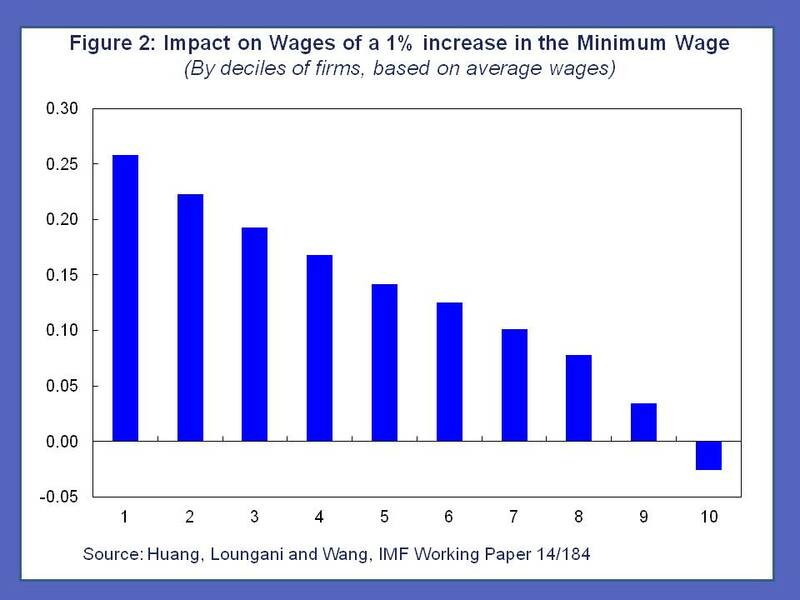 In the decile of firms with the lowest wages, a 10% increase in minimum wages lowers employment by nearly 1.8%. The impact declines steadily such that for the decile of firms with the highest wages, the impact is 0.6%. We also find that the impact of the minimum wage on a firm’s wages depends on where the firm stands in the distribution of wages. On average, an increase in the minimum wage raises wages by about 1%. But, as shown in Figure 2, for firms in the lowest decile, the increase is about 2.5%. The effect declines steadily and there is essentially no impact for the highest decile. Teasing out the impact of the minimum wage on employment is a difficult task. A firm’s employment can be affected by many factors, not all of which can be accounted for easily. Hence there is often a concern that the impact attributed to changes in the minimum wage may in fact be due to some factor that remains unaccounted for or is unobservable to the researcher. To guard against this, the evidence presented above is based on analysis in which numerous other factors that could affect employment are accounted for, as described in detail in the working paper. One strategy we use is akin to the study of twins in many areas of research—the idea there is that since twins share much of the same genetic make-up, any observed differences between them are likely not due to genetic reasons but to other factors. In our study we make the assumption that firms in contiguous regions are more likely to have similar employment trends. We then estimate the impact of the minimum wage on a firm’s employment, controlling for developments in employment at its ‘twin firm’. Without such controls, the estimated impact of the minimum wage is qualitatively similar to that shown in Figure 1 above but quantitatively smaller on average (see an earlier blog for details). Information on the employment and wage impacts of minimum wage changes is a critical ingredient in deciding where to set the level of the minimum wage. Our study provides the first comprehensive estimates of these impacts for China, which has a large labor force and whose experience may be relevant for several other emerging markets. Our evidence suggests that a 10% increase in the minimum wage lowers employment by 1%. Impacts of this magnitude have been found in studies for high-income countries but generally for sub-groups such as teenagers or low-skilled workers. We also find significant differences in the impact of minimum wages on employment and wages across low-wage and high-wage firms. In low-wage firms, raising the minimum wage lowers employment but raises wages more than in high-wage firms. The setting of the minimum wage has to be sensitive to these differential effects. As in the case of other labor market institutions, the design of a minimum wage system has to balance considerations of equity and efficiency (see Blanchard, Jaumotte and Loungani, 2014 for a fuller discussion). Minimum wages can help the cause of equity by ensuring that workers, particularly low-wage workers, have enough to live on. But if raising the minimum wage lowers employment, and ends up excluding low-wage workers from employment prospects, it may have adverse effects on both welfare and efficiency. Image: A worker travels up an escalator in Shanghai.